Aqua 15 mil reinforced polyethylene is a North American made product made of the finest raw materials and has excellent physical properties for its thickness and weight. Aqua 15’s high quality HDPE liner scrim provides excellent puncture and tear resistance. Aqua 15 also consist of a specially formulated coating allowing for excellent weld-ability, seam strength, and u.v. resistance. Aqua 15 comes with a 3 year u.v. & weathering warranty and often lasts much longer in many applications. 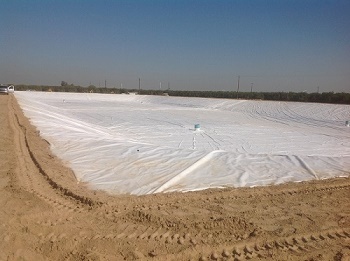 Recommended uses for Aqua 15 mil rpe is for temporary to moderate term pond liners, long term if buried; sports field liners, erosion control, and is also an excellent choice for tarps and covers such as for hay tarps and landfill covers.